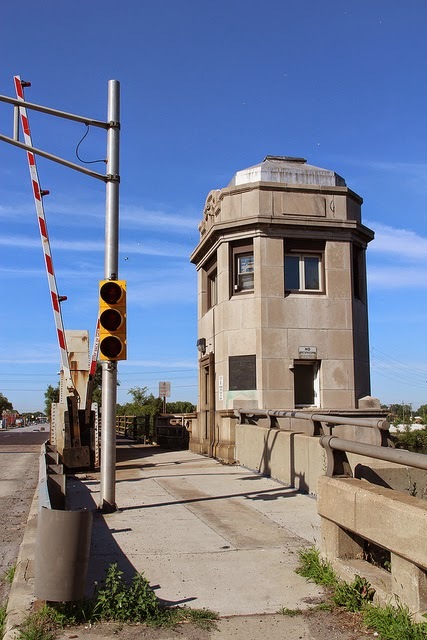 After ninety-one years of accident free operation, the Rouge River Bridge, aka the West Jefferson Avenue Bridge, sustained serious damage to its northeast side. Shortly after 2:00 AM on May 12, 2013, an intoxicated bridge operator prematurely lowered the bridge onto the Great Lakes Class freighter, the Herbert C. Jackson. It instantly collided with the north section of the double-leaf bascule bridge. The bridge's hydraulic gearing and its electrical equipment were unharmed in the accident. The bridge was closed immediately to vehicular and pedestrian traffic, both ends of the double-leaf bridge were left fully open to accommodate unhampered freighter use of the Rouge River. With this bridge in its down position, Great Lakes Class freighter access to the Ford Rouge Plant would cease. The single-leaf bascule bridge has a long history. It originated in Medieval Europe to help defend castles and walled towns by using winches and counterweights. Commonly known as drawbridges in English speaking countries, this style of bridge was used for crossing a moat or narrow river leading to the castle gate. Drawn upward with winches and counterweights when under attack, these single-leaf bascule bridges prevented easy access by invaders. Probably the most famous double-leaf bascule bridge in the modern world is the Tower Bridge in London. Construction began in 1886 and the bridge opened in 1894. Many people mistake it for London Bridge. 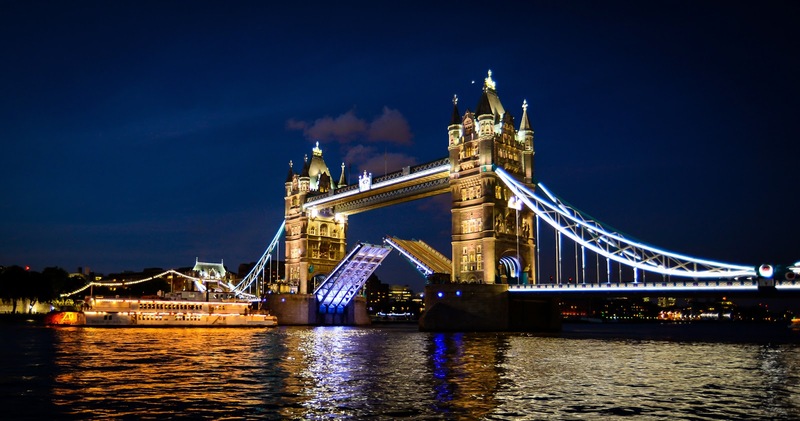 The Tower Bridge is a combination of suspension bridge and drawbridge on the Thames River. The Rouge River Bridge was completed in 1922 after some jurisdictional legal wrangling and some new law writing. The previous narrow swing bridge had needed replacing since the 1910s, and the federal government had plans to dredge the Rouge River to accommodate direct freighter access to Henry Ford's new, massive Rouge Plant Complex. 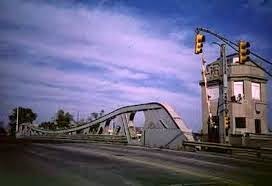 The inadequate Rouge River Bridge and the Fort Street Bridge would both be replaced with double-leaf drawbridges at the cost of one million dollars apiece. Wayne County voters approved a bond issue to fund construction. To reroute traffic across the Rouge River while the new bridges were being built, an out-of-service railroad truss bridge owned by Michigan Central Railroad was detached from its moorings. A flotilla of scows pumped full of water to lower them in the river were towed under the truss bridge. 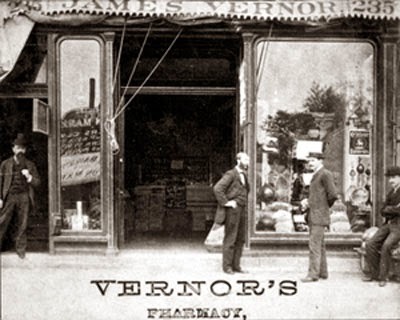 When the water was pumped out of the scows, they rose and floated the bridge with the help of tugboats to a location 200 yards upstream of W. Jefferson Ave. The Fort Street Bridge and the W. Jefferson Avenue Bridge were closed on November 13, 1920, after the makeshift railroad truss detour was in place. Rouge River Bridge fully open in winter. Each leaf of the dual-leaf bridges is supported by four 12 foot square concrete footings sunk in the clay to the bedrock 70 feet below the waterline. One worker died of "the bends" during construction because he decompressed too quickly after working in a caisson. The bascule double-leaves of the Rouge River Bridge were lowered for the first time on August 21, 1922. It opened for traffic on October 17th of the same year. 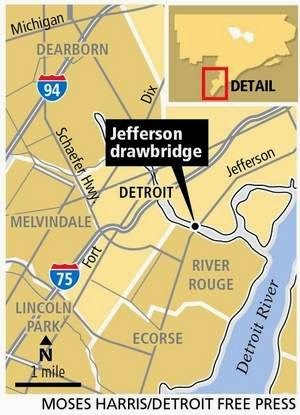 Finally, the bridge reconnected the Detroit neighborhood of Delray with the city limits of River Rouge and the rest of the Downriver area. In 1923, the federal government completed dredging the Rouge River and Great Lakes freighters were now able to navigate upstream, unload their cargo, and turn around in a massive turning basin built by the United States government expressly for that purpose. In our present time, it is estimated that twenty to twenty-five freighters navigate this narrow waterway weekly. The bridge handled 6,400 vehicles daily in 2012, according to Southwest Michigan Council of Governments data. 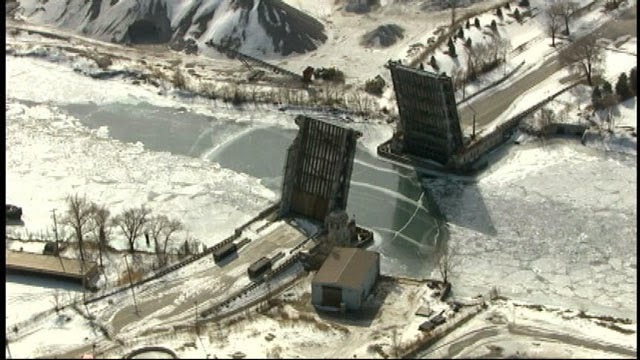 Once again, after its ninety-one year record of service, the Rouge River Bridge is closed. The collision with the Herbert C. Jackson on May 12, 2013 was the first accident of its kind in the bridge's history. None of the crew on board the freighter were injured. The 670 foot-long ship sustained a 2 inch gash in its hull about 15 feet above the waterline. The freighter's cargo was 23,000 tons of iron ore pellets destined for the Severstal North American plant in Dearborn. Cindy Dingell, spokesperson for the Wayne County Operations Office, told reporters that the bridge operator was immediately tested for drugs and alcohol and was fired from her job, but no charges have been filed in connection with the incident. Dingell said that Wayne County doesn't have the resources to rebuild the bridge and may have to ask voters for a bond issue to fix it to the tune of $850,000 to $1,250,000. The Rouge River Bridge is the only surviving pony truss bascule bridge in the state of Michigan. 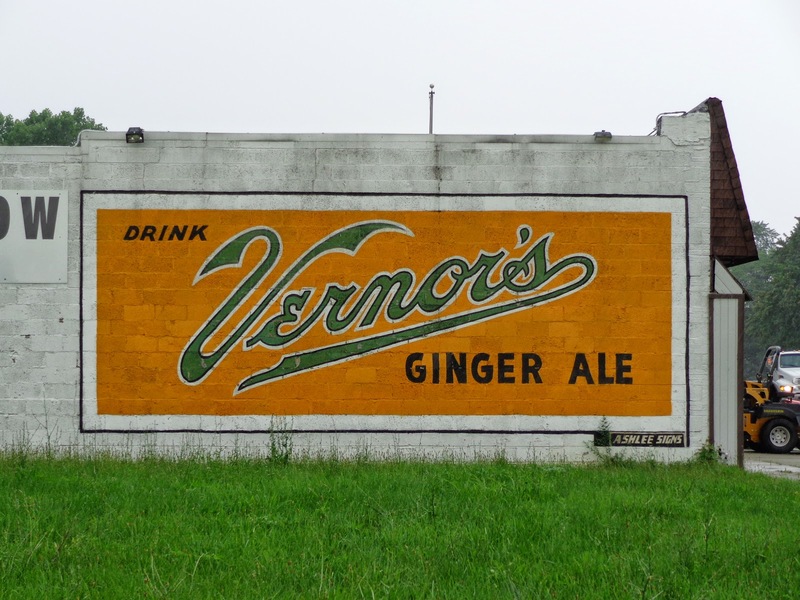 It was listed in the National Register of Historic Places on February 10, 2000. 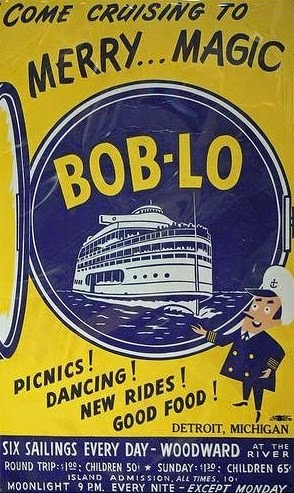 Bob-Lo Island was a family amusement park fondly remembered by Detroiters of a certain age. The park was located at the mouth of the Detroit River on Bois Blanc Island in Canadian waters off Amherstburg, Ontario. The name Bob-Lo is an American corruption of the French name for the island meaning White Woods. 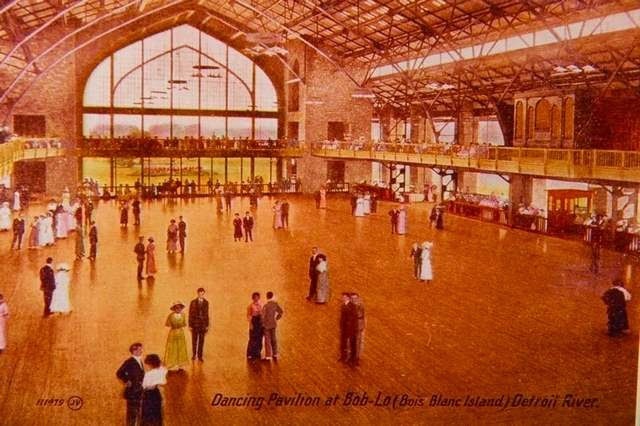 The Bob-Lo Island Amusement Park operated from 1902-1991. The park's signature attractions were the Nightmare, the Falling Star, the Wild Mouse, the Sky Streak, and the Screamer. The park also had a Ferris wheel, a children's zoo, a train, and a carousel. The island had its own marina. The dance hall boasted the world's largest mechanical organ called an orchestrion, made in Germany. The contraption with 419 pipes and an automated percussion section was fourteen feet wide and sixteen feet high. It ran on electricity and worked like a player piano. The orchestrion is pictured on the second floor balcony on the right side of the vintage postcard above. 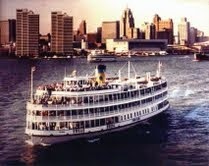 What longtime Detroiters remember most fondly about Bob-Lo was the boat ride up and down the Detroit River. Ninety-seven year old Helen Robinson remembered going to Bob-Lo Island as a kid with a church group. A sudden squall came up from nowhere and the boat's crew had to lower the canvas flaps and lash them to the railings. Helen said that they all knelt down and prayed. The boat made it to the island, the sun broke through the clouds, and they enjoyed the rest of their day at the park. Adults remember the moonlight cruises to the island. 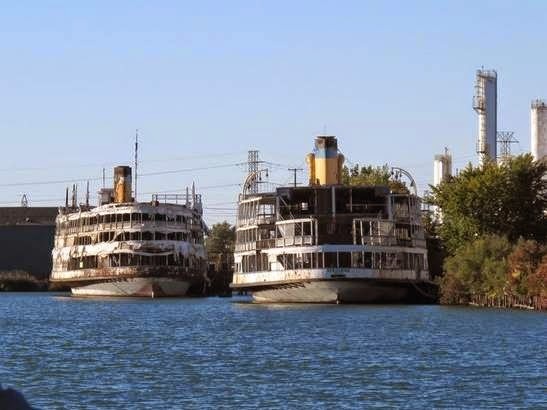 The Bob-Lo Excursion Company expanded an existing park and operated two excursion steamers out of Detroit and Wyandotte, Michigan. These Bob-Lo Boats were designed by Frank E. Kirby and built by the Toledo Ship Building Company. The Columbia was built in 1901 and went into service in 1902, while the Ste. Claire was built and went into service in 1910. Excursion steamers were built primarily for day trips. They were propeller driven, powered by a triple expansion reciprocating steam engine. 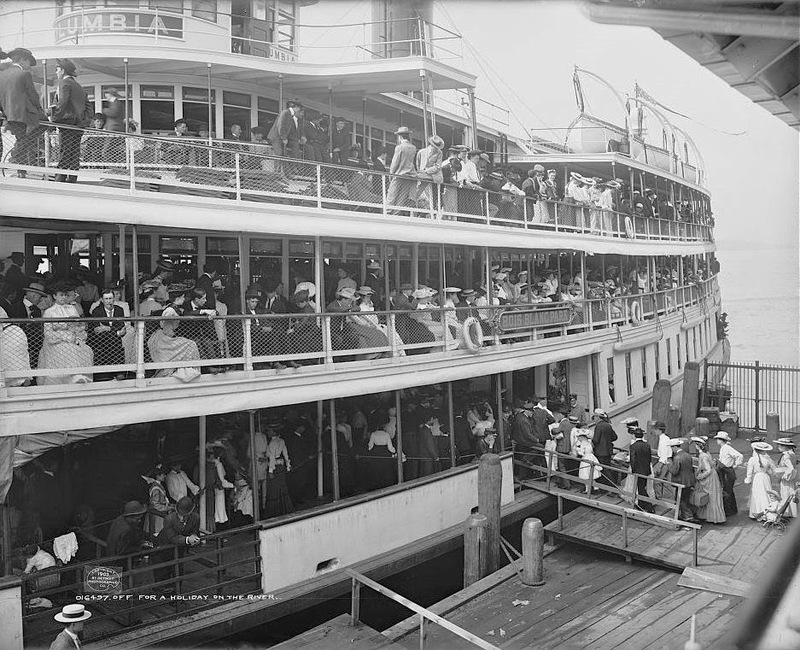 The boats were 190 feet (58m) long and 50 feet (15m) wide and were said to hold 2,500 passengers. The Columbia and the Ste. Claire are the last two steamers of their type still afloat. The Columbia ran the original Bob-Lo run for eighty-one years, a record of service on a single run unequaled in United States maritime history. In 1945, Bob-Lo Island Excursion Company made history rather than family memories. Sarah Elizabeth Ray took part in a company sponsored trip to Bob-Lo Island with twelve other female workers involved with the war effort. Ray was removed because she wasn't white. 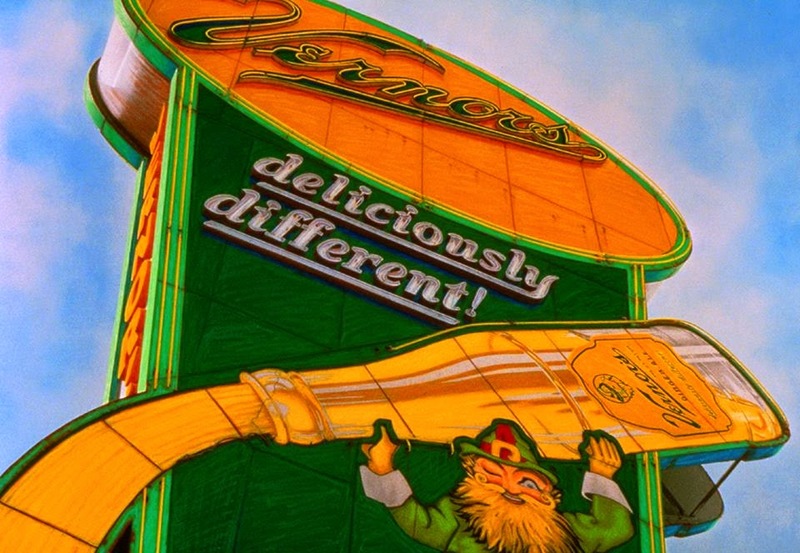 The State of Michigan filed a racial discrimination law suit against the company and won. 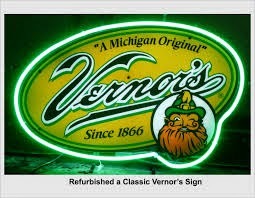 The case was taken to the Michigan Supreme court and upheld. The company policy excluded "so called 'zoot-suiters' and 'colored' because they were deemed rowdyish, rough, and boisterous." Their position was that they were operating a private concern in another country not subject to United States jurisdiction. 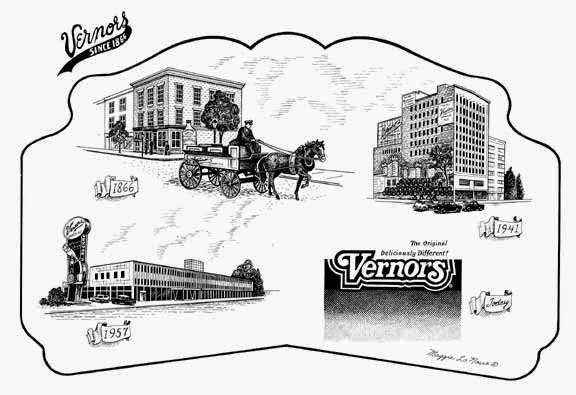 The case was taken to the United States Supreme Court in 1948 where it upheld Michigan's anti-discrimination provisions on the grounds that the company's policy was a violation of United States Commerce Department regulations. Another company tried to run the park after the Bob-Lo Island Excursion Company sold out in 1991, but the park closed permanently on September 30, 1993 and sold off its rides in 1994. The Columbia and the Ste. Claire have been moth-balled at the U.S. Steel docks in Ecorse, Michigan since 1991. 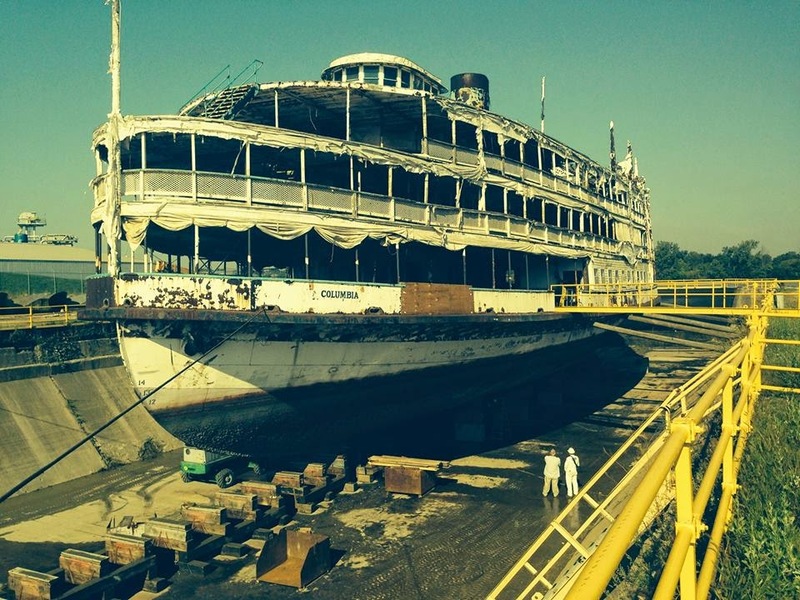 The Columbia is being restored to the tune of about $15,000,000 with the goal of being completed by September of 2015, to resume active service as a sightseeing attraction trolling the Hudson River in New York City. The Bob-Lo Boat was unceremoniously towed to Toledo, Ohio on Tuesday morning, September 16th, 2014 for a year of restoration.